Learning to drive stick in San Francisco is like learning to swim at Ocean Beach. It’s theoretically possible, but the reality of it is somewhat dangerous, mentally intimidating, and more than a little bit stressful. Word to the wise: if you don’t know how to drive stick, and aren’t excited about the idea of the lives of your seven passengers riding (pun intended) on your ability to do a successful hill start, maybe don’t take a job that relies heavily on both of those requirements. Let me back up to the beginning of this story. In September of 2015 I was finally accepting that the day-to-day reality of my startup job was not doing it for me. I wanted to be doing something different, but had never encountered a job in San Francisco that combined not sitting in front of a computer all day with earning above minimum wage. As luck would have it, my roommate was in the early stages of planning an eight-month road trip with her boyfriend that involved quitting their day jobs and living in a van. Consequently, a solid amount of time was spent looking at beautiful vans and #vanlife accounts on Instagram. When I came across Vantigo’s account (and a post that they were hiring) I was intrigued. I corresponded with Erik, the owner, and within the week I’d been offered a job doing content, social media, community management, and most of all, learning to be a tour guide. This was regardless of the fact that I did not know how to drive a stick shift, which all three of the Vantigo vans required. Challenge accepted. Fast-forward about two and a half months, one bicycle accident induced elbow fracture, and enough Vantigo employees being in the US at the same time for the tour schedule to be covered, and you will arrive at the time when my stick shift training began. I started at the Marina Green parking lot, moved on to the back roads of West Marin, and eventually began practicing the tour route around San Francisco over the course of three weeks. Learning to drive stick proved to be one of those things you just had to learn by doing- and learn by screwing up on. Luckily for me, stalling while trying to do a hill start at a four-way stop seems to be much less irritating to other drivers when you are in acanary yellow VW van. Unfortunately for me, other drivers don’t seem to realize that when I’m stalling out trying to do a hill start at a four-way stop it might not be the best time to pull up next to me to chat about their VW nostalgia. I would have figured that the sweat pouring down my face combined with the stressed out facial expression would be a dead give away of, “this is maybe not the best time to chat with this person,” but VW vans just really bring out the dreamy, chatty side of people. C’est la vie. My biggest lesson from learning to drive stick in a 1971 VW van was really one about science. In a van with four gears, gravity is gear number five. Gravity can be used to your benefit in many scenarios including but not limited to: backing out of a parking space, coasting down a large hill, and getting up to speeds not otherwise attainable by a VW van (slow is really all we know). Sir Isaac take the wheel. (Shout out to Erik, Eddie, and Justin for pulling the e-brake for me at exactly the right times). The last three weeks have seen me driving tours to wine country, Highway 1, and all around San Francisco. I’ve been having recurring dreams where I’m driving stick, and I hope this counts as additional practice. I’ve also decided that our yellow van, Jerry, who followed the Grateful Dead for ten years during the 70s, is definitely my spirit van. 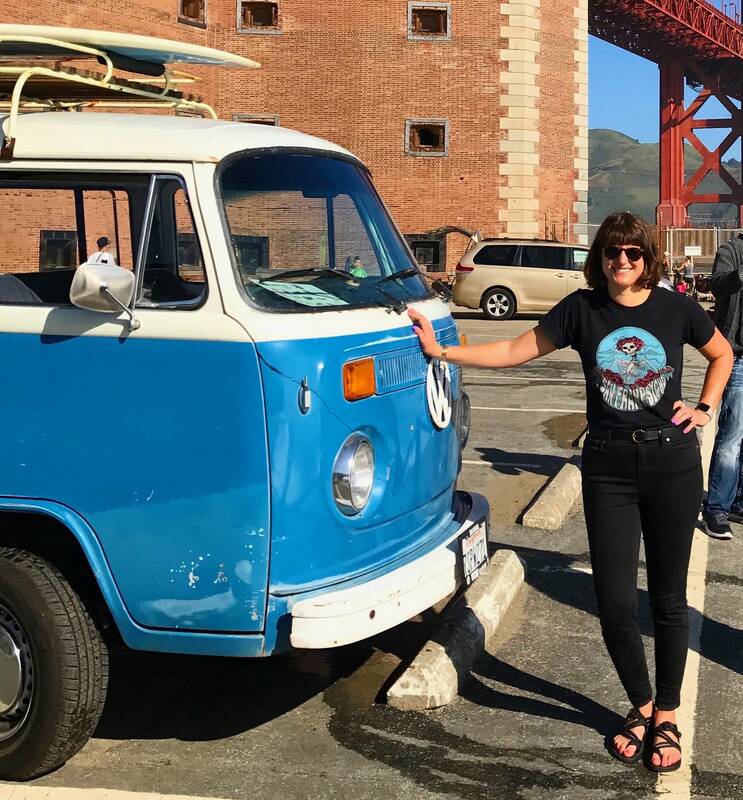 There is really something to cruising around in these vans, whether you’re driving down Haight Street or coasting down Highway 1. It just feels so right. Well, so long as you don’t accidentally go from third gear to second when looking for fourth, or try to leave a stop sign in third when you think you’re in first, that is. When in doubt, grind it till you find it.